The cost for the United States Mint to produce and distribute the cent the the nickel fell for the 2012 fiscal year, mostly as the result of lower metal costs. Despite the decline, costs were still about double the respective face values of the two lowest circulating denominations. For the fiscal year ending September 30, 2012, the unit cost for the Mint to produce and distribute the cent was 2.00 cents and the unit cost for the nickel was 10.09 cents. This compares to costs from the prior fiscal year of 2.41 cents and 11.18 cents, respectively. A component of the decrease in costs was the lower cost of copper, nickel, and zinc. From the 2011 fiscal year to the 2012 fiscal year, the average daily market prices of copper decreased 13.8%, nickel decreased 26%, and zinc decreased 15.8%. The composition of the cent currently consists of 97.5% zinc and 2.5% copper. 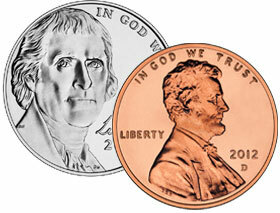 The composition of the nickel is 75% copper and 25% nickel. In addition to the reduction in metals costs, plant expenses at the Philadelphia and Denver facilities decreased by about 3%, and Selling, General, and Administrative costs decreased by 2.8%. For the 2012 fiscal year, the US Mint produced and shipped 5.835 billion cents and 1.006 billion nickels. The production and distribution of the penny generated a loss of $58.0 million, while the nickel generated a loss of $51.2 million, resulting in a total loss of $109.2 million across both denominations. These figures represented slightly smaller losses than the prior year, when the loss from the cent was $60.2 million and the loss from the nickel was $56.5 million, for a total loss of $116.70 across both denominations. This is the seventh consecutive year that the cost for the cent and nickel exceeded their face values. From 2006 to 2012, the cent and nickel have now generated total losses of $469 million. Although the cent and nickel have been produced at a loss in recent years, the positive seigniorage generated by higher denomination circulating coins has always more than offset the losses. For the 2012 fiscal year, seigniorage across all denominations remained at a positive $105.9 million. This is down by 69.6% from the prior fiscal year when seigniorage generation was $348.8 million. The decline is attributable to the suspension of production for the Presidential $1 Coins. The US Mint is in the process of performing research and development activities with regards to alternative metallic materials for circulating coins. Under the Coin Modernization, Oversight, and Continuity Act of 2010, the Mint is due to provide a report of their findings and suggestions to Congress later this month. During a recent House Subcommittee hearing, the Acting Director of the United States Mint Richard A. Peterson reported that a research and development laboratory at the Philadelphia Mint had conducted two sets of trial strikes on a variety of metallic compositions and evaluated them for attributes such as hardness, ductility, corrosion, wear resistance, electromagnetic signature, availability of raw materials, and cost. They might as well just move the decimal point over 2 decimals and have the dollar be the new penny. Use the billions of dollar coins sitting in the treasuries warehouses and stop using small change all together. You can’t even buy anything with a quarter now a days anyways. In 1913 a penny or nickel could were actually used to buy stuff, now they are used to psychologically manipulate us into thinking we’re getting some kind of deal. Why do we continue using them if they are obsolete? Bank of America is the only bank that gives out all post 1982 pennies made of 95% zinc. I wonder how much money they have saved by melting the pre1982 pennies. As long as the Mint is considering alternative metals for the cent and nickel, they should also overhaul the composition of the dollar coins. The few that actually do circulate soon morph from an attractive golden color to an icky mustard brown. Maybe we need to take a leaf (no pun intended) from the Canadians, who have successfully switched to $1 and $2 coins, while finally eliminating the one-cent coin. The people of the United States are onto the fact that you are sitting on all our gold at Fort Knox and 33 Liberty Street. Stop trying to figure out ways to debase the currency and cheat WE THE PEOPLE by “seniorage”. You have approval ratings in the teens, have spent $16 Trillion on the backs of your current and future slave tax payers. Put the g.d. copper, tin, gold and silver back in the people’s money! Unwind the Federal Reserve and all the other ponzi schemes you g.d. greedy rats! Money that has value of itself? This will not stand. We must have worthless tokens of wealth. It’s the American way? Government robs from you by inflation. Coin problems are simply a symptom of that. Yet many sheeple are still conditioned to belittle the existence of political conspiracies as the explanation for this. So this means if I convert my 401k to nickels right before the economy crashes I double my money!? Looks like I’m dropping those bad boys in the ‘ol piggie bank from now on!! Are we forgetting that our coins are made by Govt. employees, who don’t come cheap!! How much would a penny cost if it was made under a competitive contract without all the “benefits” that our Govt. employees are paid?? Yes, I know that our coins must be made by the US Mint, but little things like that can be changed!! Now, watch the responses that this comment will engender! !